Why can't I edit my billing information? When the credit card on a subscription expires, the subscription will expire at the end of the billing period. 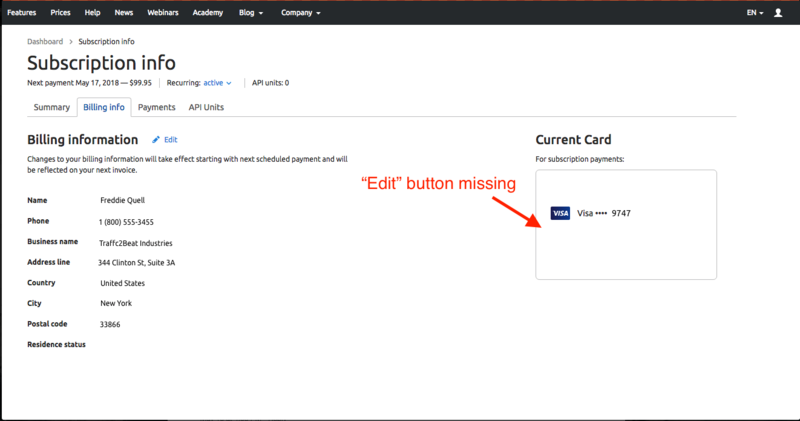 As a result, the button for editing credit card information on the Billing Info page will not be available. This is the most common reason a user can’t edit their billing information. If the card on your account has expired, you need to log in to your account (it will remain active as a free level account), go to our prices page, and re-subscribe to your plan with an updated card and billing information. As long as you re-subscribe within 30 days, your Projects and data will be saved and you can continue to use SEMrush the same as before your card expired. If your card has not expired and you are still having issues editing your billing information, please contact our Customer Success team via phone or email. How do I upgrade my account/subscription? How do I find a copy of my invoice? How much does SEMrush cost? Am I tax exempt as a non-profit business?